Sleep is for the weak. Or is it? During sleep, the brain declutters, organizes memories, and rejuvenates. But what about animals without a brain? Do they ever need a snooze? Enter the Cassiopea jellyfish. With no heart, bones, or brain, it’s one of the most primitive animals living on the ocean floor. Claire Bedbrook from Caltech realized that no one had studied their bedtime routine. 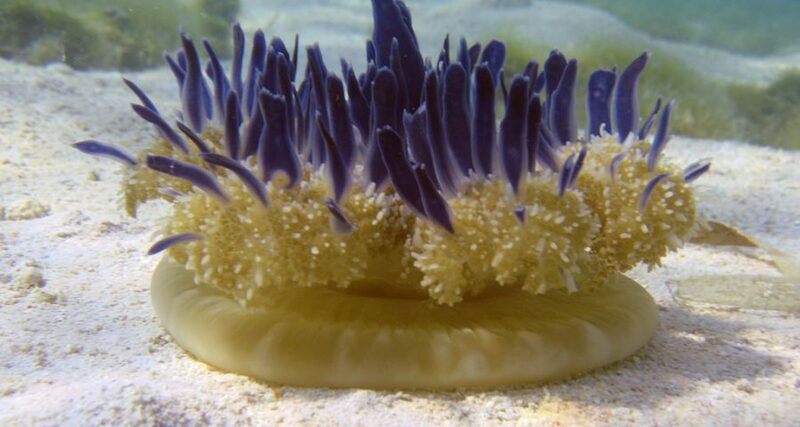 She and colleagues tracked pulsing behavior; the regular heartbeat-type movement of jellyfish. Findings? Jellyfish pulsing follows a pattern of activity and idleness resembling slumber. At night, jellies, pulse thirty percent LESS compared to activity in the daytime. Only poking the jellies or introducing food into their tank seemed to wake them up! Despite a sea of trouble, sleep seems to be crucial even for the most primitive animals. Jellyfish have been around for millions of years. It appears we don’t need a brain to sleep. Perhaps other brainless creatures sleep, too. In short, early to rise or early to bed? Eh, just hit the snooze button instead. Hashtag: Evolutionary Winning!